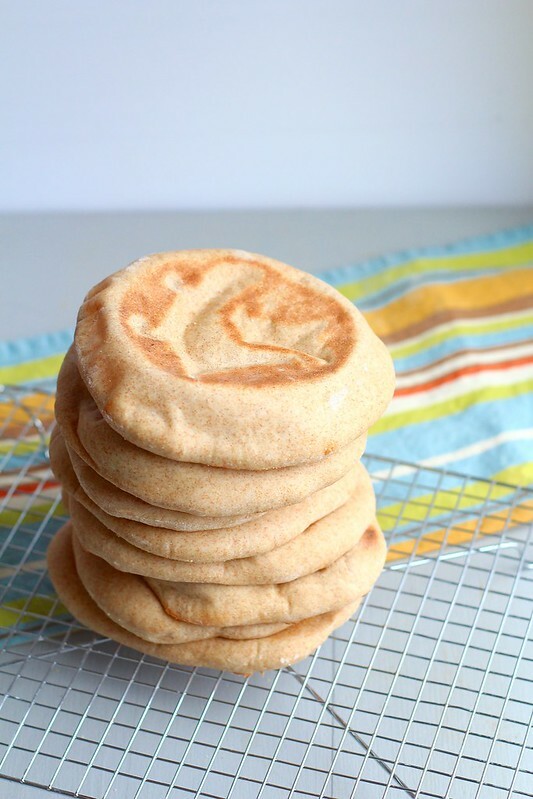 So, is pita bread still a thing? I still remember the first time seeing it really in use. When I was a kid, I would work for a few weeks on another (tiny) island being the cook's helper. The chef would make pretty extravagant dinners, and the occasional lunch. Most often for lunches, she would lay out huge platters of vegetables, deli meats and condiments with pita bread as the sandwich vessels. It was always my job to slice each pita in half and open the pockets and arrange them nicely on a platter. 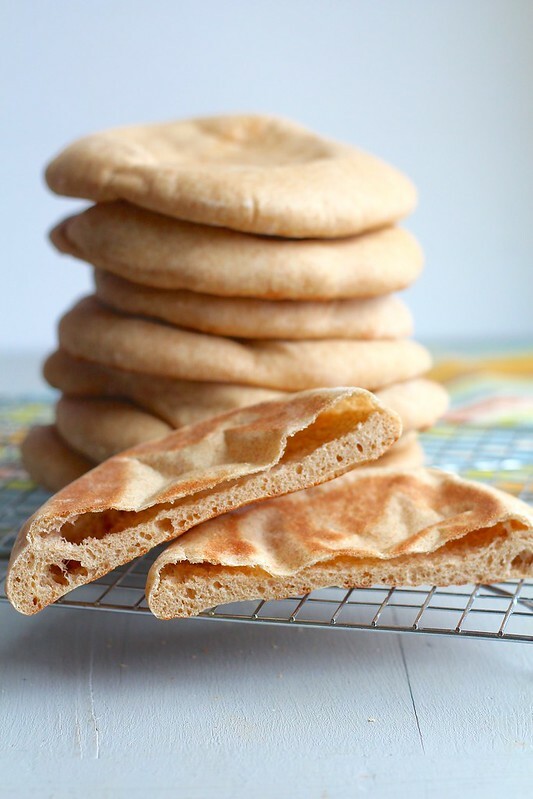 I can remember thinking how cool the idea of pita bread was. I mean really, it's like magic! You bake a flat piece of dough that magically has a large air bubble in the center, which then can be stuffed with amazing fillings. Genius. These days, I can't seem to find pita bread anywhere in the stores. Perhaps I just haven't looked hard enough, or they aren't a popular choice in my remote location. Either way, I don't have to worry about finding them in the stores anymore. I can just make them! They are actually pretty simple, and a large batch can be easily made and frozen for future use. As always, making anything from scratch always yields better tasting food. Plus, it gives you the satisfaction of doing it yourself! Make these, then make my killer falafels! In the bowl of a stand mixer combine the yeast, honey and 1/2 cup of the water. Whisk in 1/4 cup of the bread flour and 1/4 cup of the whole wheat flour into the yeast mixture until smooth. Cover the bowl with plastic wrap and set aside until doubled in bulk and bubbly, about 45 minutes. Remove the plastic wrap and return the bowl to the mixer stand, fitted with the dough hook. Add in the remaining 3/4 cup of warm water, 1 1/4 cups bread flour, 1 1/4 cups whole wheat flour, olive oil and salt. Knead on low speed until the dough is smooth and elastic, about 8 minutes. Transfer the ball of dough to a lightly oiled bowl, turning once to coat, cover with plastic wrap and let rise in a warm place until doubled in bulk, about 1 hour. 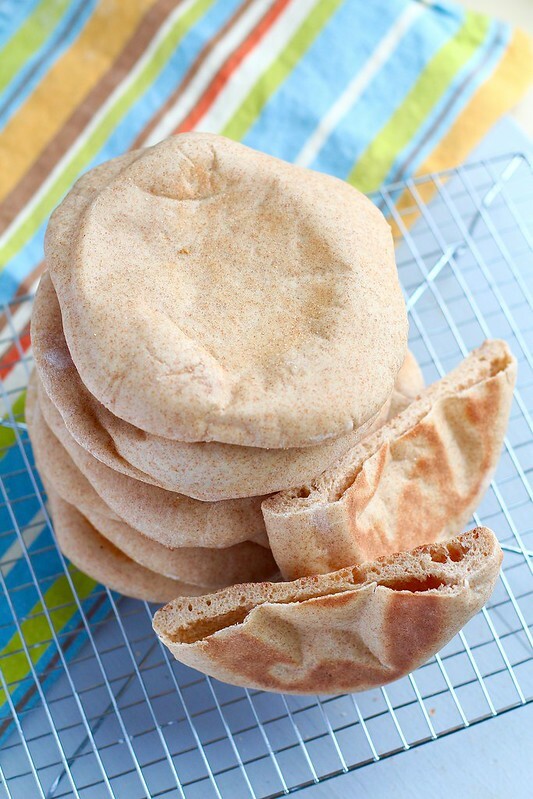 Sprinkle cornmeal on 2 baking sheets, or a counter space for the pita rounds. Once the dough has risen, transfer to a lightly floured surface, gently punch down the dough and divide into 8 equal pieces. Form each piece into a ball. Flatten one ball at a time into a disk, then press out into a 6 1/2-7 inch circle. Transfer the rounds to prepared baking sheets or counter. Once all the rounds have been shaped, loosely cover with clean kitchen towels. Let stand at room temperature for 30 minutes, until slightly puffy. Meanwhile, preheat the oven to 500ºF. Place a baking stone in the oven (if you have one) on a middle rack. Transfer four pitas, one at a time, onto the preheated baking stone, or directly on the oven rack. Bake for 2 minutes, until puffed and slightly golden. Gently flip the pitas over using tongs and bake for 1 minute more. Transfer to a cooling rack and let cool completely. Repeat with the remaining pitas. Store in an airtight container for up to 4 days, or freeze for several months.